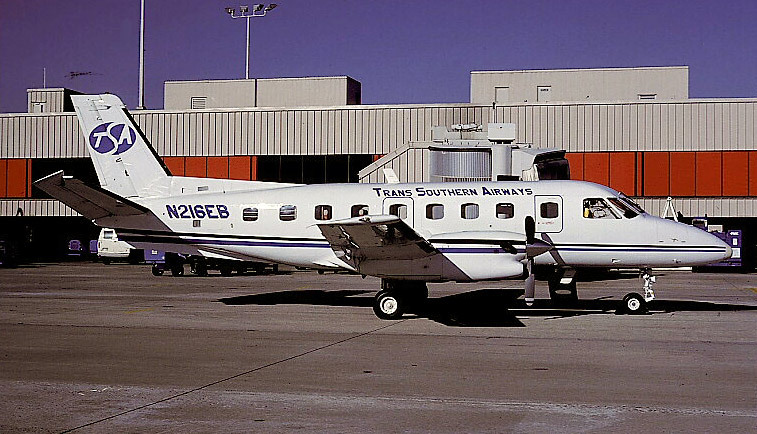 During 1984-1985, Trans Southern flew between Atlanta and Florence, SC, New Bern, NC, and Jacksonville, NC, routes that had been dropped by Piedmont Airlines. The airline also flew between Florence and Charlotte, NC. TSA operated Piper Navajos and Embraer Bandeirantes. Bandeirante N216EB is shown at Atlanta in 1985. Trans Southern timetable effective August 1, 1984. Courtesy of Arthur Na.